The ultimate gift for that Firefighter in your life! Aprons are available in black and are one size fits all. They're a heavy 5.3oz cotton and approximately 34" tall and 27" wide. These will tie around someone who has a waist up to 55"! 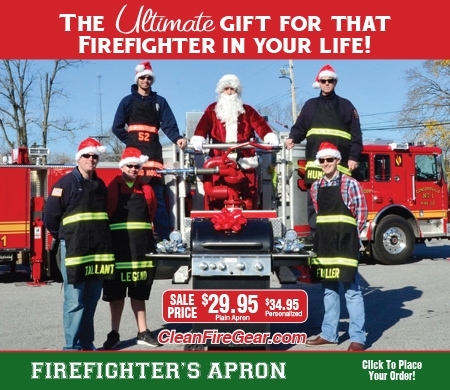 Aprons are the perfect gift for any firefighter who loves to cook or just show their firefighter pride. All letters and triple trim are made of authentic 3M Scothchlite ™and machine stitched onto the apron. They're available in lime green or orange. Aprons can be washed and dried as needed. Machine wash cold and dry with low heat. Our firefighter aprons will surely spark things up with the firefighter in you. Get yours today while supplies last!!! For Plain Fire Gear Apron CLICK HERE.